Yo! We've had a very busy string of weeks, and it feels weird to keep info from you guys. What I can say is that we have a bunch of awesome shows and opportunities and music coming very soon. Well isn't that always? ​at the Devil Strip for this awesome write-up! Check it out here. Also this will be in physical print for their May issue -- stop in your local Akron business and grab heim! More new content! So we got wind of the folks over at NPR Tiny Desk Concert holding a contest for original musicians to potentially be featured. We decided to throw our name in the hat w/ our jam "Change Your Mind" -- check out the video to your left and wish us luck! TODAY IS THE DAY! Ok, well we are excited to announce that our new single + visual for "GET BUSY" is now available online worldwide. We've created a smart URL for easy access to watch, share and stream the song! Please play it in the car, with your friends, at the kickback or in your solitude with the AirPods . Thank you and we love you all for the support. Hope you all enjoy! CLICK HERE TO STREAM, DOWNLOAD AND BUY THE SINGLE! Hello again. It's so cool to still meet like this in 2019 -- these blogs and post seem so archaic, but I hope you appreciate the "from me to you" type feel. Anyway, as promised, the roses are back in action w/ new music! On 4/6 we will have a BRAND NEW tune for you folks titled "GET BUSY" -- We can't wait for you guys to hear it!! We actually created a PRE-SAVE option for you all, please Click this Link and Spotify will remind you when it drops! Hey guys! Really quick update. We've finally gotten our "SHOP" section up and running, and wouldn't ya know it, we've got some awesome sporty new tees for you guys! Now available, in collaboration w/ Personal Hell -- we bring you our Spring Summer "Burning Rose" 2019 tee! Available now for purchase, along w/ new Pins! SHOP NOW and support your boys! Thank you guys, stay tuned for more exciting updates, soon to come! Happy New Year! We here at the RRP HQ are off to a strong start with fresh visuals for your viewing pleasure. We recorded "Caught Up" with our good friends over at Still Moving Creative -- check them out for all your visual needs. "Caught Up" is a song off of our album we dropped in May called TIME ATTACK - which is available for streaming and purchase here. Can you believe there's another update being posted to here, before the end of the year? 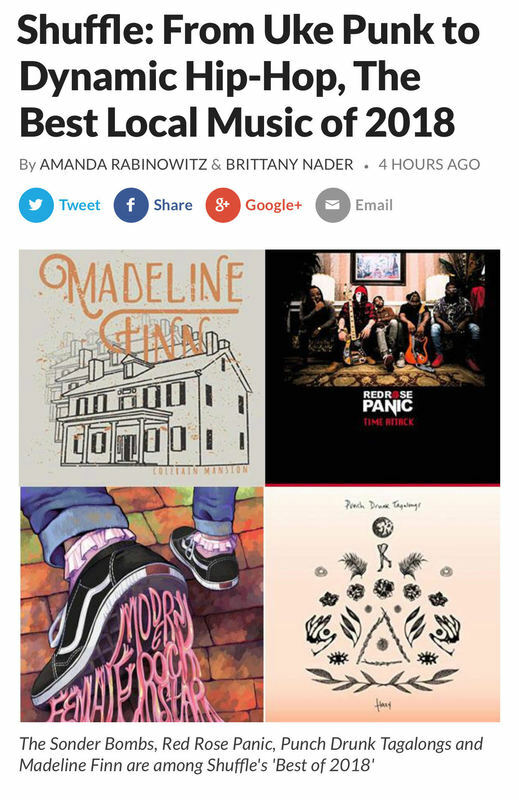 That's right -- we wanted to give a big shoutout and thank you to our family over at WKSU NPR radio for selecting us as one of their "Best of 2018" -- a beautiful article written by the awesome Amanda Rabinowitz & Brittany Nader! Thank you guys so much, and check the article out here! Seasons greetings! Just wanted to stop by and give you guys a heads up on our updated show list. We will be making our return to Los Angeles a month from today, so you have to imagine we are really excited about that. The shows have been going very very well and it's always a joy and pleasure to see each and everyone one of you out! We've got a lot of new music and surprises for 2019. Stay tuned. Whew! 2018 came and went chile. We have had quite a blast this year. From our latest album 'Time Attack" dropping back in May to performing at the Rock n Roll Hall of Fame and traveling to Los Angeles as a band for the first time, were a few things that topped my list. We aren't done and haven't even begun to fight. New shows ahead on the horizon, and we head back to Los Angeles, early next year. Catch us at a date near you, and hey -- do you want to book us? If so, please reach out to us at redrosepanic@gmail.com to get us to a city near you. New music and visual surprises, coming soon! It's so wild that November is already here. Another year of memories in the books, and this one right here is right at the top of the list. We shot a visual to one of our songs called "BEEN THERE" (available now from the album TIME ATTACK, available on all streaming platforms) in Los Angeles California, last month. Check it out on youtube now, or click the link to left! More shows and updates coming soon, thank you guys again for all the continued love and support!! Yo! A bunch of new content headed your way. First, we want to say how awesome of an experience Los Angeles California was. We were able to capture a portion of our trip, check out th visual to the left to see what we did and also some of our Sofar Sounds Los Angeles performance! Don't forget to like and Subscribe to our YouTube channel! 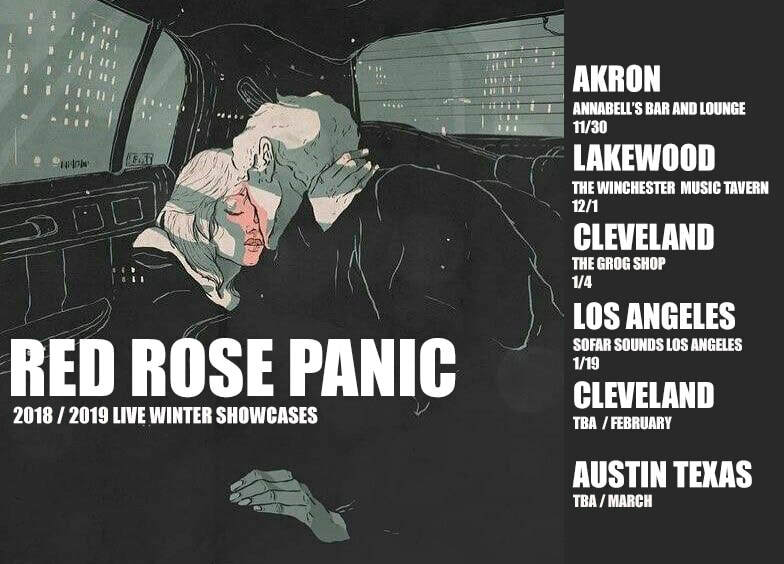 More new updates and shows added -- and yes -- the Roses are headed to LALA land, just like the boy Bron James!! Unfortunately it'll be a short stay, but we are super blessed to have the opportunity to work with our Sofar Sounds family again. We will be back home and ready to jam in Cleveland 10/30, and then back to our hometown of Akron 11/16 (Empire Concert Club is so aweome -- the stage and lighting, smoke and all that fun stuff, can't wait to see the potential visuals and footage we'll get from this show) -- but yeah, we are LAboyz this weekend. Be sure to follow us on instagram @redrosepanic to keep up w/ all the LA action and beyond!! Hooray for late updates! If you guys didn't know -- we've started a podcast series called the " RED ROSE PANIC PODCAST" (catchy name, right?) -- anyway, here's our 3rd episode where we discuss upcoming things within our arena. We also have some tip and suggestions for new acts and bands who want to know what it's like to get started. Please like and subscribe to our channel HERE! Yo! I just wanted to say a quick thank you to those resilient fans who pop in and out of the website, each and everyday.. Will there be a new upload?? New announcement?? New video?? Lol, well we have an awesome announcement today. We have been selected as a finalist to perform at this years "AFRO PUNK FESTIVAL" in Brooklyn, NY! So here's what we need YOU GUYS to do! We need you to CLICK THIS LINK, THIS LINK RIGHT HERE, YES THE TEXT. And scroll down and vote for RED ROSE PANIC! You can vote 1 time every 24 Hours from a single device!! Huh?? What's that I see over there yonder? A new update on Red Rose Panic's illustrious website? You're goddamn right. Clevelandddd!! We've got a couple shows headed your way. 5/24, 5/27 and 6/6!! Also, how are you guys enjoying the new album? If you weren't aware (shame on you), we released our new album "Time Attack" worldwide on all major streaming platforms. That's all the news I've got for today - but of course there's always more exciting news to come! Oh happy day, we have finally reached the release of our new album Time Attack. This is a new collective effort from the Roses that meshes the many different genre's of the Akron Ohio native Dynamic Hip-Hop Band. You'll hear flurries of awesome guitar riffs, live drums, live bass and dreamy keyboard melodic chords to help fully paint the picture. Get it now on Apple Music and Stream it on Spotify! ​"Time Attack" and we couldn't be more excited to deliver it to you guys. We wanted to drop a little dose of what you can look forward to on the project via visual to the left -- "Change Your Mind" by Red Rose Panic is now live on YouTube. There will be a special album version of this, also! Please like, subscribe to our youtube and share the video! Yes, you're seeing this correctly. An actual update on our website! We are happy to announce that our new album "Time Attack" is finished and heading to you May 3rd!! Also, for all of our local Northeast Ohio fans and friends, we have an Album Release show at Annabells in Highland Square, Akron OH! We are super excited to get this masterful body of work to you all. It's been five years along this journey, and we plan to make a statement with this album. We want to be the best in the world at what we do, and that was our approach while writing and creating this project. Time Attack will be available on all streaming platforms, and we will also sell physical copies the night of the show. Happy New Years to everyone! I Just wanted to stop by and drop a quick update. We are about 90% done with our new album #TimeAttack, which should be dropping very soon, early 2018, for sure! We are very excited to deliver this project to you all. A lot of you have been asking for new tunes and we are proud to be able to Finalllyyyy get this new stuff rolling! 2017 was one heck of a year, big shows and festivals galore. We only hope to up the bar for 2018 -- So to start off, we released a cover to Justin Timberlake's latest single "FILTHY." We title these special remakes as #RedRoseRemix. We've done this before to Sah Baby's "Pull Up With Ah Stick," Last year. Check the visual out to the left and be sure to like and subscribe to us on Youtube! Red Rose Panic was recently featured on “Live at Howard’s” -- a new 10-episode series highlighting the best in live local music premieres October 12th on WBGU-TV. The series looks to bring traditional late-night music oriented programming back to local public television. New episodes air Thursday evenings at 11 p.m. and repeat at 3 a.m. throughout the weekend on WBGU-TV. Check out our episode over here to the left! "Defend the Land" our official Cavs Playoffs 2017 anthem is now available on YouTube. Super excited for this song. Best of luck to our Cavaliers as they push forward toward another ring. My my my, what an awesome 2017 it has been so far. We've just wrapped up an exciting string of awesome shows, ending with our most recent at Beachland Ballroom & Tavern with Ghost-Note! 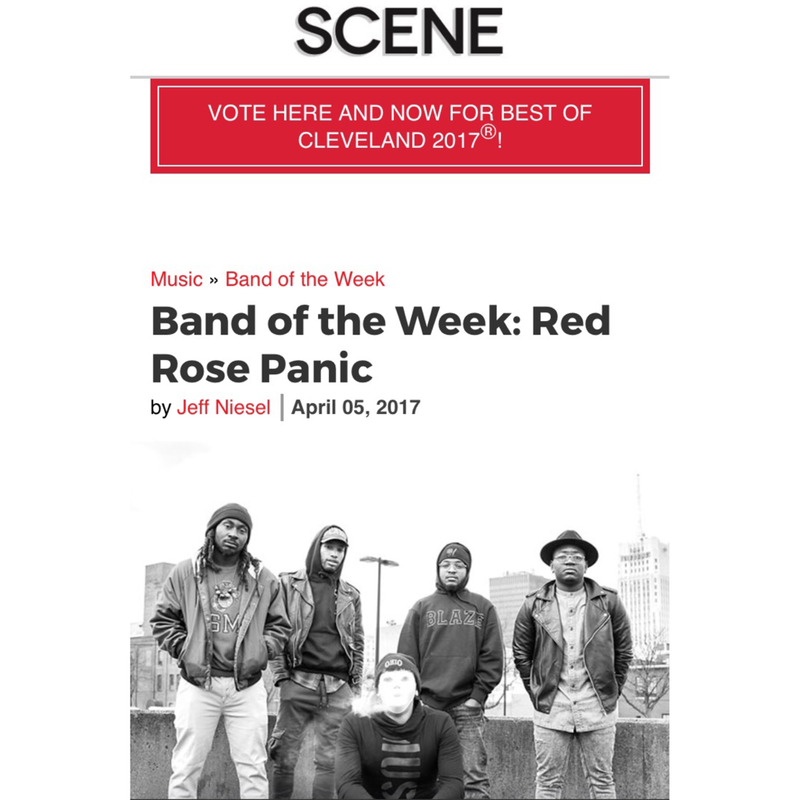 But before that, we were selected as Cleveland Scene Magazine's Band of a he Week. Unreal. We've got a bunch of exciting updates coming soon. More music and chances to see us live, coming soon as well. Thank you all for the continued support. Find your light and goodnight. What's up. Just wanted to drop a few quick updates on here for the one time. We've got some new visuals and new songs that we have posted up, so make sure you check those joints out. We've recently had the pleasure to visit Detroit to perform at Sofar Sounds Detroit. Absolutely beautiful city, we had a blast and we've also got some footage of the trip that we will have up. Also, tons of new shows coming soon, stay tuned for those dates. Greetings and Happy New Year to all!! It's crazy to even think that we are going into Phase 4 of this Red Rose Panic thang. It's only right that we kick the year off with an awesome new song & live performance, right!? HUGE shoutout to the folks over at Sofar Sounds & Sofar Sounds Cleveland for once again giving us an amazing platform to showcase our talent! Check out the visual and be sure to tell a friend. Also, stay tuned for some new show announcements coming up for February! Greetings. We are proud to present a new awesome visual from our Sofar Sounds NYC experience. We had a blast traveling and performing for this awesome NYC crowd. Check out our latest visual of us performing a new song called HULK HOGAN. More updates, music and other media soon! Greetings! Just wanted to stop by and drop off our new single PARTY TIME, EXCELLENT. This song was a blast to record, and we also have a new visual for the song. You can check that out here. Grab this song off of iTunes now! Hey guys, just wanted to stop by and make a quick update. As you may or may not have noticed, we've been focusing a lot on our live shows. We are on the tail end of our "LOCALS ONLY TOUR FW16" -tour, we'd like to say thank to all the awesome venues and supporters for coming out. We've got a couple more shows to wrap up, so be sure to catch us if you haven't yet (or come again and bring a friend ;) ). As we move forward into 2016, we leave behind 2015 as another good year in the books, for the Roses. We plan to continue to take strong strides forward, progressing more within our art and sound. A couple of new visuals have been curated to get you more-- how do I say- more in-tune with what we do and who we are. Thank you to The Cue Brand and INDI media for the awesome creative assistance. Check the most recent visual to the left, "Destination Dream" -- as it takes you behind the scenes to how we tick, a couple keys to success are dropped, and our vision is also further elaborated upon. .
Quick update for everyone. I want to thank everyone for visiting the site and listening/ sharing the music. We've been working on some fresh new "Live" visuals with friends. These visuals will be brought to you from a "Live At Home" perspective. We should have these up pretty soon for you all. We have been actively chipping away on our 2nd tour; the "Locals Only Tour FW1516" -- We are working to have a compilation of all those shows and such created in visual format. We will try to. We've got a few more dates on our schedule, so if you missed us last year, you have a chance to catch us in the new year. Thank you all again and we will be back with updates, soon! Just wanted to make a quick update. It is my pleasure to announce that we, RED ROSE PANIC, have officially applied to SXSW Austin Texas! Wether we get accepted or not... is kind of up to you guys. Well, not solely you of course, but you can help! One of the ways SXSW keeps track and checks the leg work of the bands who apply is by Facebook. Yes, Facebook. 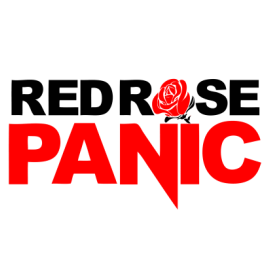 If you haven't done so already, please take a moment to "LIKE" our band's Facebook page at: Facebook.com/redrosepanic -- by doing so, you'll be able to see all of our pictures and shows and most recent content, as well! It would also help us out a lot! Stay tuned for more updates, and always check out the "Shows" section to catch us Live! Hey guys, just wanted to touch base with you all and provide a few updates. First, I want to give a shout out to the good folks over at NEVER NOT WORKING, LLC. With their creative genius, we were able to provide a visual to each remaining song on our ep. That's Danger Zone, Play My Game & Hoppin Fences. Also, check out the "Blood Roses" visual, which was actually the first RRP anything that we recorded. You can now see the EP in full visual form. There are some hidden gems in which certain videos link to the next, so make sure you watch everything in chronological order! We have some exciting new material and shows coming up, so continue to stay tuned for more news and show updates!! ﻿First show of 2015, guys. Hope you guys can make it out to this awesome event! #TheRefresh event, Powered by Sprite & Willie B Music! --#TheRefresh is dedicated on discovering & showcasing talents that provide a unique perspective in today's musical landscape. Through revealing interviews with progressive talents, showcasing pieces on emerging trends and cultures, and presentations of products in their raw form, we speak to the influencers in their own language." One of my favorite websites of all time interviewed us a few months back! Grinding.org is a spot I would always venture to growing up musically, over the past decade or so. It's everything Star Trak, The Neptunes & N.E.R.D primarily,-- as some of you may know, they were & are a HUGE influence on us. Anyways, they premiered their installment of "Grindin Talk" w/ us. It's like a really dope online magazine article with pictures and more -- the most detailed and in-depth piece of knowledge about us we have released, to date! Check it out in the link below! 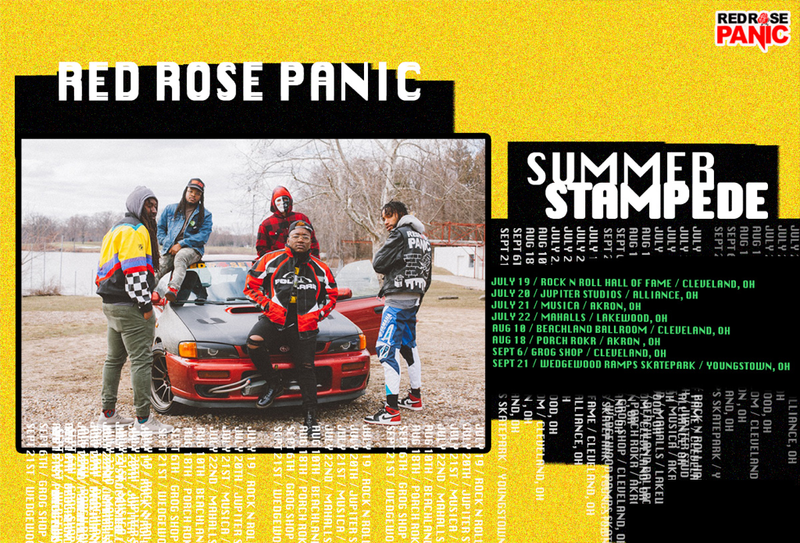 GRINDIN X RED ROSE PANIC! As the Fall and Winter seasons approach, we've got to keep up the heat. As in to say, we plan to deliver a new project available to you all soon entitled "Time Attack." Throughout this new creative project, (well, while it's underway) we also plan to drop some more visuals. If you haven't already subscribed to us on YouTube- please do so. Or you can also check out our "Video" section on this site. Staying disciplined and consistent with content is currently our main focus. We've started these "bi-weekly" or 'whenever the hell I get enough footage worth editing' type visual editorials. These are kind of behind-the-scenes views with Red Rose Panic. It may be studio footage, performance footage or maybe us traveling somewhere. Or us just goofing around... because if you've ever been around us, there is rarely a dull moment. So anyway, sit back and relax. Season 2 or" SZN 2" of this Red Rose Panic project is underway. We are gearing up for future shows and performances for fall and winter. Make sure you are following us on Instagram & Twitter for all up to date info on what we are doing! @redrosepanic for twitter/ instagram and Youtube. It's been a while, to say the least. A lot of things have changed since the EP has released, a lot of eyes were opened. More shows, more visuals, more networking opportunities and fun in the works. We've appreciated all of the support and feedback we've gotten thus far. We owe it to you guys to constantly continue to grow more and more. We've been blessed with some major opportunities in the works. I'll have more updates for you guys later, but for now; check out our EP if you haven't done so yet (Shame on you). We've also have exclusive Instagram and Twitter Pages now available. Follow on on Instagram and on Twitter. Oh! Also, check out our YouTube Channel, as well. We will have some awesome content uploaded on there. New videos up now --if you haven't check it out yet, please do so! As always, thanks for the support and stay tuned. The day has finally arrived. The Roses drop their debut EP "One Night Standard" available now on iTunes. Click the image to the left to purchase the album. You can also listen to the album on their Soundcloud. We've worked really hard to deliver our emotional tones, passions and overall take on how we see music. Here's to taking risks, chasing your dreams and following your heart. We present "One Night Standard." Hey folks! We just wanted to express our love and gratitude to all the overwhelming support we have been receiving! Thank you for all of the follows and retweets and grams! If you have not done so yet, follow us on twitter and Instagram "@redrosepanic." Tomorrow, June 27th, marks the day we drop our debut music video for our single "Run!" -- if you have not heard the tune yet, check it out under 'audio' - the visual will also premier here world wide at 7PM EST! Again, thank you for all of the continued support! The journey thus far has been quite amazing, and we look forward to continuing as strong as we started! Quick update! 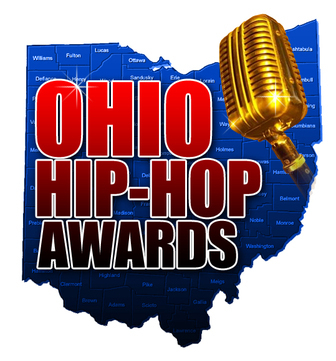 Red Rose Panic will be hitting the road this weekend to showcase at the Ohio Hip-Hop Awards! Friday, we will be in Columbus @ Skully's! I believe the show begins at 9PM, tickets are $10 -- and Saturday the 14th @ Vortex in Akron! Show starts at 8PM, tickets are $10, also. The shows in Cleveland and Cincinnati sold out pretty fast, so hit us up if you need tickets! More info can be found in our "Shows" section of the site. Hope to see you there! Quick update. We are finally approaching the finalization of our EP "One Night Standard" due out this spring. New media coming soon, including a visual for our single "RUN!" shot by Wilatoma. New photos added to the Photo section of the site, so be sure to check those out, as well! As always, we are continuing to create a new aesthetic standard and raise the bar for music within our city. We appreciate all of the continued support. Stay tuned, this summer is going to be a wild one.